Everyone says breakfast is the most important meal of the day. Well at my house, with two young kids, breakfast is also the busiest time of day! That's one reason I love this Cinnamon Raisin Oatmeal Breakfast Bars recipe. You can make them over the weekend and serve them during the week–everyday if you'd like! They're healthy and delicious, and make a perfect on-the-go-snack. 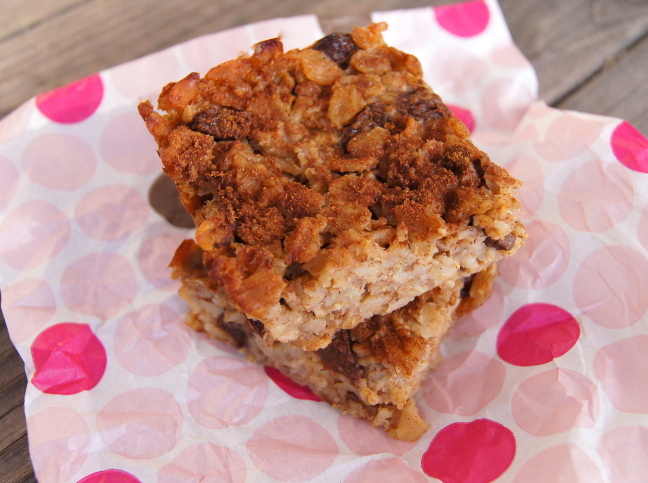 Cinnamon Raisin Oatmeal Breakfast Bars recipe: healthy, delicious, and makes the perfect snack. Step 1: Preheat the oven to 350 degrees, and line an approximately 8x8x3 - inch baking pan with parchment paper. (Use a wide enough, and long enough piece of parchment so that it will cover the sides. Then use scissors to cut a diagonal slit in each corner, so that the paper lies flat in all areas.) Set aside. Step 2: Add the milk, water, vanilla, 1 tablespoon of the cinnamon, and 2 tablespoons of the brown sugar to a medium sized pot. Use a whisk to blend all of the ingredients until you no longer see dry cinnamon. Step 3: Add the raisins, place the pot over high heat, and bring to a boil. Step 4: Reduce the heat to medium - low and add the oats. Mix to combine and let this simmer until all of the liquid has been absorbed, about 15 minutes. Step 5: While the oatmeal is cooking, mix the remaining tablespoon of brown sugar with the remaining teaspoon of cinnamon. Step 6: Remove the oatmeal form the stove and evenly spread it into the parchment - lined pan. Step 7: Sprinkle the cinnamon - sugar mixture evenly over the top and place the pan in the oven for 25 minutes. Step 8: Remove the pan from the oven and let it sit at room temperature for at least 30 minutes. Step 9: Gently remove the baked oatmeal from the pan by lifting the parchment paper. Then you can cut it into 16 even squares. You can either place them back in the baking pan and cover with plastic wrap, or wrap them in packages of 1 or 2 for snacks. These will be good for a week in the refrigerator.